Sandalwood use as a sensual fragrance exported out of India into the Northern hemisphere dates back to the old silk road from India into the Middle East eg. Cleopatra. It’s use in complex compounds (fine fragrances) dates back to 700 AD when it was utilised as the fixative in a novel innovation that is known as an attar perfume. Arabian perfumery attars are still a major consumer of sandalwood oil with an estimated 30,000 Kg’s consumed annually. Western perfumery origins can be traced back to the 17th century through aristocratic use. Broader consumption began in the 18th century with the advent of perfumery and glovers. Grasse (France) became the world capital for this trade. With the advent of brands like Guerlain, perfumes such as Shalimar (19th century) stamped the place of sandalwood in western perfumery. Santalum album (Mysore) and Santalum spicatum (Plaimar – West Perth) were the two main sources of sandalwood pre the second world war. Spicatum dropped out of use in the 1960’s until Mt Romance reintroduced the oil into fine fragrance in 1997. With the advent of synthetic products and globalised price cutting, precious ingredients such as sandalwood are often being used less and less. Sandalwood is unique in that it’s complex base is both a fixative and a unique signature fragrance in it’s own right. To date all attempts to synthesise this complex ingredient fall short of offering a replacement. Santalum spicatum was first distilled in Albany in 1882. In 1919 Plaimar revolutionized the cost base of oil production through a solvent process and was able to take 100% market share in the 1920’s, building a state of the art factory in West Perth, WA. Plaimar’s focus in the 1930’s was sandalwood oil for pharmaceutical purposes. The oil was mainly exported for ingestion and as pre-penicillin was literally a life saver. Traditional ingestible pharmaceutical applications were for sexually transmitted diseases and cystitis. In 2000 Mt Romance invested heavily in proof of concept around spicatum research and development with a focus on cystitis and acne and penicillin resistant anti-microbial usage. Oil distillation is an art and science, which is why it takes years of experience and ongoing research and development to produce the finest sandalwood oils. DSO’s management team have been steam distilling sandalwood and other essential oils since 1999. DSO receives various grades of wood which are inspected before being transferred to the wood processing facility for pre-grinding. DSO management through years of research and development have perfected its distillation process to ensure that all the desirable elements from the wood are extracted resulting in a premium sandalwood oil. Unfortunately, wild stands of all native sandalwoods are highly vulnerable to illegal logging by poachers seeking to make a quick financial gain from these scarce resources. DSO believes that a high percentage of sandalwood oils traded internationally are produced from illegal wood with many buyers and end users of this oil completely unaware. Within Australia, sandalwood is protected. Under the new WA Biodiversity Bill 2015, which will replace the Sandalwood Act 1929, parties and companies found to be illegally harvesting and or handling the proceeds of illegal wood will be fined up to $1 million plus face a custodial sentence. DSO works closely with the Department of Biodiversity, Conservation and Attractions, to ensure all wood processed by DSO is compliant and legally verified. Kutkabbuba Aboriginal Corp (KAC) is a committed stakeholder and shareholder in DSO and will make available its harvested sandalwood as and when. The wood will be purchased by DSO at transparent market prices, ensuring a fully realised return to KAC for their valuable timber. 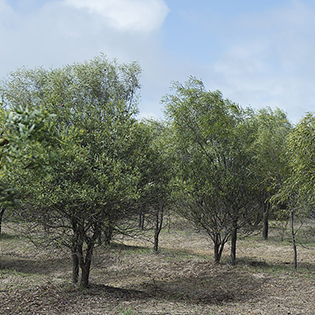 Dutjahn Sandalwood Oils has competed on equal terms with the private sector and won a supply contract from the State Government (Forest Products Commission) to supply 1,000 tonnes of wild sandalwood over ten years to compliment its plantation reserves and the vast pristine desert forests of Dutjahn Custodians. As part of IFEAT Athens 2017, Ultra International B.V. published it's Essential Oils Market Report which reported on Dutjahn Sandalwood Oils and the start of a new era for West Australian sandalwood oil.